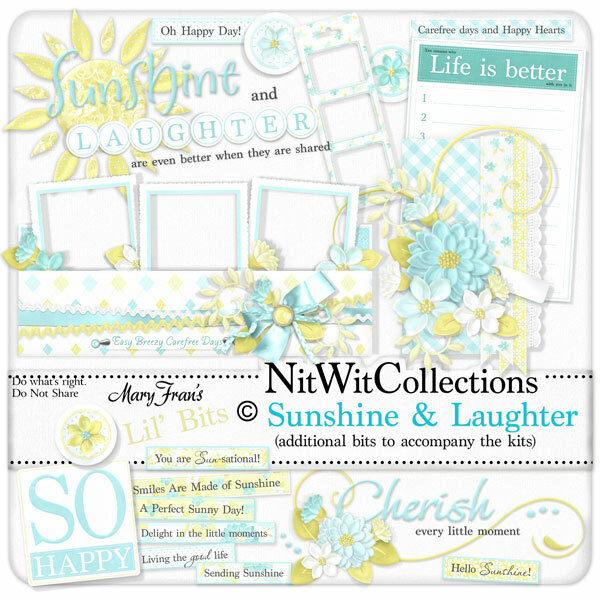 Lil' Bits "Sunshine & Laughter" has many digital scrapbooking and card making elements that are already put togther for you. The pocketframe, stickers, word art and even a Top 10 List, help you to enjoy the creative process even more by being able to simply place these into your creations without the work of having to create them yourself. These elements in the Lil' Bits are NOT included in the "Sunshine & Laughter" FQB. 1 Wordart - "Cherish every little Moment"
1 Wordart - "So Happy"
1 Wordart - "Sunshine & Laughter...."
9 Wordstrips filled in with phrases that we thought may work for you.